This is probably going to go down as the book that’s had the biggest influence on me in 2009. Though it should be said that it’s actually two books in one volume, published by Sprinkle Publications, a publishing house in Virginia which specialises in old Christian books from the 1800s, which they reprint in beautiful hardbound facsimile editions. The first book in this volume is The Family In Its Civil And Churchly Aspects by Benjamin Palmer, pastor of First Presbyterian in New Orleans in 1876. It’s split into two parts. The first part explains how the Biblical model of family (monogamous husband and wife, with children) is at the very core of society. Because God has created the institution of families, children grow up learning how to obey authority, how to treat each other kindly, in an environment with just the right mix of affection and discipline – thus preparing them to be model citizens of society. He then goes on to expound this point with a chapter devoted to each role in the family (husband, wife, parents, children, and – most controversially – servants). I must admit, I was expecting a book from 1876 to be full of cringeworthy advice along the lines of, “The husband calls the shots. The wife does blindly whatever she’s told. The children obey or get smacked.” I’m not sure why I thought this was the standard view of the 19th century – but that’s what I was expecting. However, I was amazed at one of the most balanced descriptions of marriage and parenting that I’ve ever read. The chapter on the authority of parents is worth the price of admission in and of itself. The second part of Palmer’s book on the church was a little bit less convincing for me, because I had more trouble tracing his line of thought, compared with the first part. I understand that he sees family as showing us something of the relationship of Christ and the church, but it wasn’t made as clear as the first part. Still worth a read, though. After a very strong first book, I thought the second book in this volume would have to be a strong contender to match it. It was. Thoughts on Family-Worship by James Alexander (pastor of a Presbyterian Church in New York) and originally written in 1847, is the most sustained and passionate argument for families to worship together in their homes that I’ve ever read. Chapter by chapter, Alexander hammers home at families (especially fathers) that they should be gathering their family every day to read the Bible, sing praises to God and pray together. He spells out the benefits for fathers, for children, for families, for what it does in hard times, for how it benefits society, how it benefits the church, etc. etc. While there are bits here and there that may be legalistic (for instance, I’m not sure where Alexander gets the idea that kneeling is the only legitimate position for praying), but the overall vision that he paints of what could be achieved in the church and amongst Christians if we took the time to focus on God every day (and he’s arguing for morning and night, by the way) is challenging and inspiring. It made me realise that if many of these old stalwarts of the faith were to show up in 2009, they might think those of us calling ourselves Christians are a bit soft . . . Anyway, I didn’t need to read very far in the book, before I got back in the habit of gathering my family together and reading the Bible and praying straight after dinner. I’m not sure how many of my Christian friends (especially those who are fathers), would make the time to read two books written in somewhat flowery language from the 1800s, but the ideas in this book have given me the most refreshing re-think about my family that I’ve had in years. I’ve done some reading off and on about this subject over the years, but the old question of baptism by immersion vs sprinkling popped up on my radar again, so I decided to read this very short little book that had somehow ended up on my shelf. It’s very short, but immensely helpful. It was written in 1884, by presumably a Presbyterian Minister – though all we’ve got is his initials and last name to go by – W.A. Mackay. While I’m not sure of the exact circumstances surrounding this book’s publication – the situation is remarkably similar to our own time. Basically, as the author states in his opening section, you could go 20 or 30 years in a Presbyterian / Reformed church and never once hear a sermon on why we baptise by sprinkling or pouring vs immersion. Meanwhile, the Baptists of the day (the same as now) were making it quite clear to the Christian world that they didn’t consider anything other than an adult immersion baptism as a valid baptism. And considering that is the sign of being a Christian (according to Baptist theology), it’s a serious charge to level. After reading this, I went and had a flick through the Baptist book I’d read back when my eldest daughter was little. At the time, I hadn’t been convinced by the Baptist argument, and I’m still not. I understand how they arrive at their position, and I understand why it makes sense to them. I also believe that it’s not the make-or-break point of Christianity. But I’d encourage everyone – Baptist or Reformed alike – to make sure they understand the theology behind this sacrament, because if there’s one thing you can’t ignore – it’s that baptism is an important sign. To try to ignore it and pretend that it doesn’t really matter is missing out on a really spectacular ritual that God has given to us. No 7 on the 1001 Films list . . . I don’t like my chances of seeing the whole lot, but I’m enjoying the ones I do see. As we’re in the tale end of the 19-teens (1919, to be precise), it’s mainly DW Griffith that’s getting a look in. 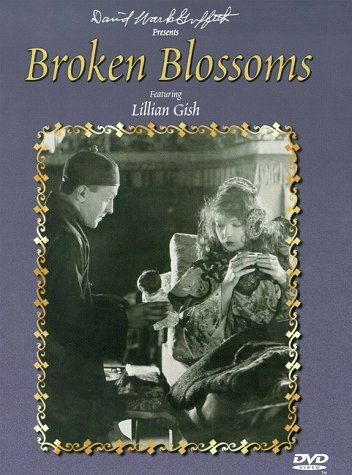 I’ve already reviewed his Birth of a Nation and the brilliant Intolerance, but this film, Broken Blossoms, goes to show that he could make films that ran for less than three hours that were just as compelling. Much as I love long films, there’s something to be said for something brief and effective. The plot on this one is really simple. A Chinese man (Richard Barthelmess) decides to come to the West with the ideal hopes of teaching white men about the truths of Buddhism. When we cut to three years later, he’s living in London, running a knick-knack shop by today and spending his nights in a depressed cloud of smoke at the local opium den. Meanwhile, our other main character is Lucy (Lillian Gish), the abused daughter of a boxer by the name of Battling Burrows. The story is really about these two lost souls connecting with each other, and the consequences that come about from it. There are some slightly disturbing elements to this film. For starters, none of the main Asian characters are played by Asians. Also, typical of Griffith’s films, the characters have more symbolic names, rather than real characters. The story is not about real people, but about larger than life emotions. So thus Richard Barthelmess’ character is referred to simply as the Yellow Man (but there is a name above his shop, for those who look closely). There’s also the element that the Lucy character is only 15-years-old, so while he treats her a lot more nicely than her violent father does, isn’t there something seedy about his intentions as well? The film attempts to deflect this by making quite clear that nothing physical happened between them, but the question is still there. However, if you can put all that aside, you will get sucked right into this film because, as usual, Griffith is the master of emotional manipulation. He knows instinctively which scenes make our blood boil, and which make them melt, and they’re all thrown into this film. Scenes of troubling viciousness (even by today’s standards) are placed alongside scenes of tenderness, and if you give into it, it will move you. Probably of all his films I’ve seen so far, this one gets to the core emotions the fastest and plays them the loudest, thus setting a trend for Hollywood of what it is that engages an audience’s emotions as they watch a film. Emotional manipulation of the highest order. I was rather excited that this film got a theatrical release, because I’d heard about it a few weeks ago and it was pretty much going straight to DVD. But Dendy Newtown brought it out for one night (albeit courtesy of a church in the area who sprung a Q&A on us after the film was over). The story behind this documentary is that Christopher Hitchens, the prominent atheist – an Englishman residing in Washington DC – wrote a book a few years back called God Is Not Great – Why Religion Poisons Everything. From what I understand, in 2007, he invited any religious people who wanted to debate him to come and have a go. Many people have, and for most people who are unprepared, I think he’s pretty much eaten them alive. Somewhere in the middle of all this, in 2007, a Reformed pastor from a place called Moscow in Idaho (how bizarre is that?) called Douglas Wilson, decided to take Hitchens on and so the two men had an online debate on www.christianitytoday.com. It’s also not mentioned anywhere, but Doug wrote a reply to Christopher’s book called God Is. How Christianity Explains Everything. Anyway, they collected the back and forth debate into a small book called Is Christianity Good For The World? and then someone got the smart idea of sending the two of them on a debate / book launch tour. This film is a documentary that covers those three days on the road. For 90 minutes, we watch them debate, sign books, drink beer, ride in taxis, ride in limos, debate, followed by more conversations in cars. And somewhere in there they got a helicopter ride as well. What of the arguments themselves? I’ll let you track the film down for yourself – you can get it from Amazon.com – to see the full thing, but as far as I could tell, Christopher Hitchens was arguing the case – most of the time – that Christianity (or religion in general) was just an extra crutch people were trying to use to prop up morality (which could exist quite fine on its own) and that, in fact, it had produced quite the opposite. (You’ll hear the killing of the Amalekites mentioned on quite a few occasions.) I’m sure if we’d seen more of the debate, we’d have come across other objections such as Christanity being unscientific, relies on the supernatural, etc. Douglas Wilson, on the other hand, was using what’s known as a “presuppositional” argument. He’s right up front in assuming that there is no such thing as neutrality, there’s no “neutral” platform to stand on and engage with facts – instead you have a set of preconceptions. So he’s quite comfortable with believing the Bible is true, and then building his entire worldview around that. The rest of his argument was then pointing out that, if you adopt a certain set of assumptions, you have to live by them. For instance, if you believe, as an atheist, that everything evolved by chance and that there is no rhyme and reason to why we’re here, then you can’t really have any set reason for assuming objective moral standards. You can make some up, to make your life easier, but there’s no reason that they should be true for everyone in the whole world – if we’re all random bits of protoplasm. Which turned out to be the chink in Hitchen’s armour. It started to clog up the last 30 minutes of the film, but Wilson seized onto the fact that Hitchens kept wanting to use moral terms against Christianity (“It’s a wicked cult”, etc) without giving any justification for his morals (apart from that we “intuitively feel” that certain things are right and wrong). That’s still not likely to convince somebody to become a Christian (human nature is that we like to have justice, but we don’t really like the idea of a God breathing down our neck that we have to answer for), but for me, it’s enough that I could never be an atheist. I couldn’t live with the level of uncertainty that they have to have. I don’t know that you’d claim that anyone “won” the film, but I would say that Hitchens probably carried the argument for the first hour of the film, because he’s a very good public speaker. Wilson, on the other hand, seemed to be thinking of so many things at once, that his thoughts would come out a bit fast and furious. Also, because Wilson makes no bones about assuming that the Bible is true, when he starts talking about something like Jesus prophesying the fall of Jerusalem in 70AD, I’m sure it would have sounded quite foreign to non-Christian ears. (Hitchens’ body language at that point certainly conveyed that he felt like he was stuck next to the village idiot.) However, over time, this becomes a bit of a strength, and we watch (especially in the non-debating moments) as Wilson is actually teaching Hitchens things about the Bible that he never really knew before. The last scene of the film is also quite an interesting one, albeit it for no other reason, than it proves yet again that alcohol brings thing out that we cover up in our everyday conversation. I won’t spoil it for you, but it shows that there may be other things going on that are underneath the level of the positions being argued. To finish, the best thing about this film was simply that I got to get together with a bunch of friends on the Christian side of things and on the atheist/agnostic side of things and have great conversations afterwards. That doesn’t happen very often in our polite, Aussie society where religion and politics are off the table, so I was very grateful to Hitchens, Wilson and co. for the opportunity to have the discussion.